Unless you’ve been living in the forest for the past month, you have no doubt heard of Pokémon GO, the latest “it” ap. Everyone and their mom is playing this game, and I mean that pretty literally considering how many parents and kids I’ve seen playing together. Now, I’ll start off with a little disclaimer: My experience as a Pokémon fan has been a bit different from other people born in the ’90s. Like other millennials, I collected the trading cards and watched the animated show, but unlike other millennials, I never cared much for the video games. I also lost a lot of interest around the time generation three came out, because I didn’t like the fact that there were now more Pokémon characters than I could remember or keep track of. 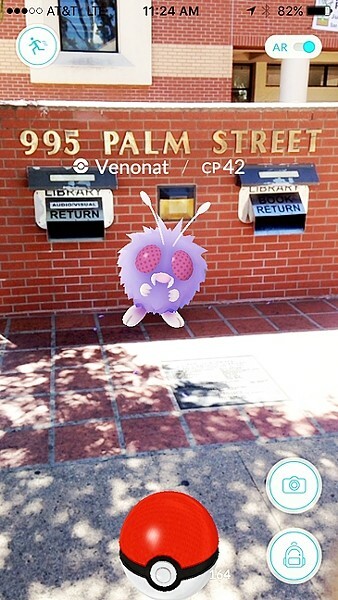 STUDYING UP: A Venonat lurks near the book return slot at the public library in downtown SLO. All of this changed when Pokémon GO was announced in September 2015. It was the augmented reality that hooked me. I was ready to turn myself into a gamer and study up on hundreds upon hundreds of fictional monsters in order to achieve the 8-year-old me’s dream of becoming a real life Pokémon trainer. After the announcement, the game did not begin beta testing until six months later, and it took another two months for the beta version to come to the United States. I was not one of the lucky applicants chosen to play the beta, but I did get an opportunity to play earlier than most since a close friend of mine was. Nine months after the initial announcement, despite signing a very strict non-disclosure agreement, my friend handed me her phone and allowed me to catch a Pokémon using her app. We were waiting in line for a ride in the Wizarding World at Universal Studios, so I ended up having an extremely emotional, nostalgia-fueled geek-out due to the fact that I had just caught a Caterpie next to Hagrid’s hut. I now had the experience of capturing a Pokémon, at least (which I thanked my friend tearfully and profusely for), but I was not a Pokémon trainer yet. Finally, on July 6, the game launched rather unexpectedly, and my time had come. I was at work when the news broke, but that didn’t stop me from immediately embarking on my journey. I caught my real first Pokémon, a Bulbasaur, in the break room during my lunch and gave it the name “Breaker” in honor of the circumstances. That night, even though I worked a late shift and didn’t get home until around 11 p.m., my roommate and I went on what would be the first of many “Poké walks” together. We wandered around our neighborhood until about 1 a.m. looking for Pokémon and Poké Stops, and during that time we encountered three other players out doing the same thing we were. I initially thought that those encounters were due to the hype of the newly released, highly anticipated game, but over the next few weeks I discovered that crossing paths with other Pokémon trainers was an extremely common occurrence, particularly near Gyms and Poké Stops, and especially when the Poké Stops had lures. I even met a security guard downtown who was playing during his shift, thrilled to finally have a means of entertaining himself while on patrol. Of course, I didn’t need to hunt down strangers in order to spend time with fellow trainers. I went on so many Pokémon excursions with my roommate and other friends that I ended up sunburned, and work became a lot more enjoyable after I convinced my bosses to start playing and realized that we could reach two Poké Stops from our back room. Best of all, I used the game as an opportunity to hang out with a crush of mine, and in addition to catching several high quality Pokémon, we also helped take over a Gym and discovered a cluster of three Poké Stops that were all lured and surrounded by about 60 or 70 people even though it was 10:00 p.m.
Needless to say, Pokémon GO has changed lives, mine included. I guess my childhood dreams weren’t as unrealistic as I thought. New Times Editorial Intern Katrina Borges is out catching Pokémon. Send comments to Arts Editor Ryah Cooley at rcooley@newtimesslo.com.